Beekeeping runs in our blood. Even my grandparents were in love with bees and so it is certainly not very astonishing that even I contracted a passion for beekeeping which is still alive. 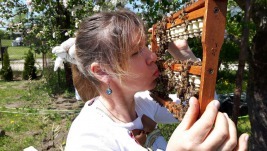 After studying agricultural sciences in Kaunas (Lithuania) 1992 which I ended up with a degree as a graduate engineer agr., I concentrated on learning more about beekeeping and therefore specialised in four more semesters and finally ended up with a master’s degree under professor Straigis. Often somebody asks what a “master” is-is it something like a beekeeper-master? Well, both are not comparable, to become a master you have to have an examination at the chamber of industry and commerce so that you have the right to run your own business and educate somebody. Master is an academic degree that you get when you had an examination at university so that you are able to teach students. I absolved studies accompanying internships in two apicultures in Germany (in Schleswig Holstein and in Bavaria) and in a professional beekeeping in Luxembourg. We, my husband Ramunas, my brother-in-law Arunas and I provide in annual average 150 beehives, in the months of May to September also 350 apiaries are in use. In our beekeeping, both the Buckfast bee as well as the Carnica bee is used. We have a pure Buckfast breeding and our own lines. For not putting the breeding results at risk, we work in cooperation with an Austrian apiculture in Carnica breeding as a reproducer. We came to the Buckfast bee through a pure coincidence; my first touch with bees in Germany had been quite different. At my first internship in Schleswig Holstein I loved to breed Carnica bees, so that I wrote in my Master's thesis that the future of beekeeping lies in breeding the European Carnica bee. At that time, my old employer supervised 220 economic colonies and one island colony situated on an island. 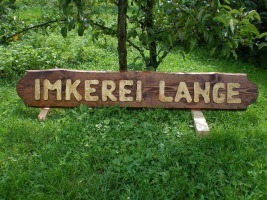 My subsequent insights into beekeeping in Bavaria encouraged my impression. 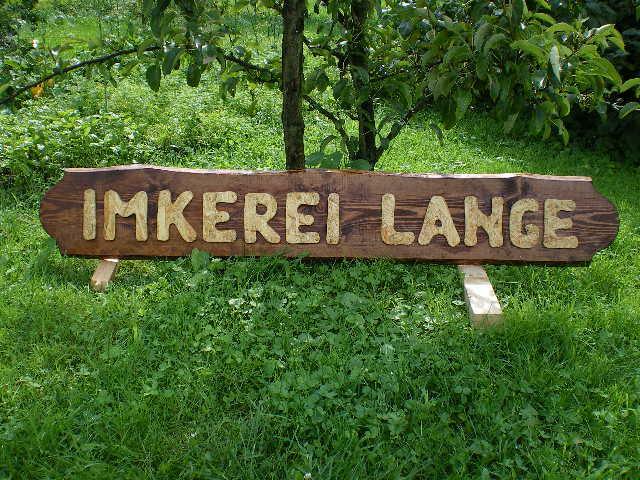 In this large beekeeping, 500 economic colonies of the breeding direction Carnica Sklenar have been cared. In addition to queen production they propagated colonies nationwide. I enjoyed working in both apicultures and had great fun because I realized the close connection to what I’ve learned at university. 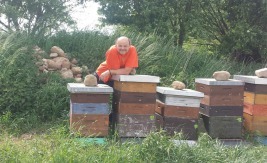 When I absolved a season in Luxembourg, my attitudes had completely changed towards beekeeping. Although my employer has been working at that time, he was able to cultivate about 300 economic bee colonies and 400 copulating units. At this point I mustn’t explicitly mention that typical work like the control of the colonies hasn’t been possible at all. Besides, I was initially puzzled about the fact that they hadn’t offered me protective clothing such as veils for example. They just told me that such clothes didn’t belong to the equipment of beekeepers in Luxembourg. I can still remember that I called my husband and asked him to send me my equipment to Luxembourg (just in case). It was pleasant to work in short pants and T-shirt in summer at 32 degrees Celsius, without having stings all over the body and just look for a cooling place. However, I didn’t need these clothes…... I could count the daily bee stings on one hand. I really enjoyed the work in this apiculture and for that reason I worked there for two more summers. When I then went back home, I had 19 colonies with fertilized Buckfast queens in luggage. My employer made a special price for a friend. So much about the beginning of my love for Buckfast bees which quickly influenced the whole family. Not every beekeeper (and even not every scientist), who writes and talks so vehemently against Buckfast breeding, can look back on so many similar opportunities and compare these to other experiences.